Asus has launched its latest smartwatch ZenWatch 2 in India. The ZenWatch 2 comes in two sizes, 1.45-inch (WI502Q) and 1.63-inch (WI501Q). The 1.45-inch version is priced at Rs 11,999 while the 1.63-inch variant is priced at Rs 14,999. Both the smartwatches are available to purchase via Flipkart.com. 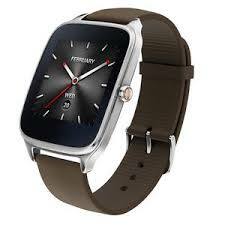 The Asus ZenWatch 2 runs Android Wear and offers Asus ZenUI integration with a range of software features. You can control several phone settings such as Wi-Fi among others right from your smartwatch. The Asus ZenWatch 2 WI502Q which is available in silver colour option, features a 1.45-inch Amoled display with a screen resolution of 280x280 pixels and a pixel density of 273 ppi. It is available in silver colour option. The Asus ZenWatch 2 WI501Q features a 1.63-inch AMOLED display with a screen resolution of 320x320 pixels and a pixel density of 278 ppi. It is available in silver and gunmetal colour options. Both the variants offer 2-finger touch support.